It seems fitting that while I'm here in Edinburgh, Scotland for the Social Enterprise World Forum, I found an article on CNN called "Scottish glen takes highland fling with big beasts." 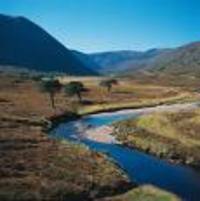 Paul Lister is a landowner of a 93,000 hectare tract in the Scottish Highlands at Alladale, 45 minutes north of Inverness, and he intends to reintroduce big species such as bear, lynx and wolves on his Alladale Wilderness Lodge and Preserve. He wants to do this as a way to reintroduce species that have gone extinct in this area of the UK in a controlled manner. He is working closely with Oxford University's Wildlife Conservation Research Unit (WildCRU) to ensure the release of species is done in a prudent manner. When deer and sheep were introduced into the area in the 18th and 19th century, much of the land was felled in order to accommodate the grazing requirements of these animals. This in part resulted in the decline of these big species. He has already introduced wild boar into the area as well as some elk which are helping with aerating the land to allow the seeds from trees to germinate. Mr. Lister is running into some obstacles from the Ramblers' Association of Scotland. According to the article, "since 2003, Scotland has had right to roam legislation, allowing members of the public access to the countryside, but Lister's plans include a boundary fence, which, critics say, will keep the walkers out­ unless they are prepared to pay for a guided tour­ as well as keeping the animals in." The ramblers fear that if Mr. Lister gets his way, several areas which should have public access will become "modern day Jurrasic Park." I think Mr. Lister has good intentions, but it may be short-sighted. Species don't tend to stay in an enclosed area, especially species such as the wolf which is known to travel great distances in packs. Focusing on reforestation projects may be a better approach with a small introduction of animals as he's already done with the boars and elk. Turning this into a tourist attraction undermines his intentions if indeed he is altrusitic. Do you think a landowner has the right to introduce dangerous species onto his land and why? What other ways can we work to preserve land? Do you think the ramblers should have their walking rights based on the 2003 legislation? Or should the legislation be changed in order to accommodate Mr. Lister's request? It may not be perfect what Mr.Lister is doing, but no-one else in the UK has the guts to start the ball rolling. I presume you are from North America. The converse should be asked, should countries get rid of all their dangerous animals? Wolves and other large carnivorous animals were made extinct in large parts of Europe in an age where man had to have dominion over all of nature. Hopefully the position has changed. Millions of pounds are spent on nature conservation and deer culling, which could be better used in the preparation for the re-introduction of large predators. Thanks, Stephen, for your comments! I just want to make clear that I am not against reintroducing predators. I think what is an issue here is that a private individual is doing this and whether that makes sense. You're right, I'm from North America, and we introduced the grey wolf into Yellowstone National Park in a controlled manner that included input from private individuals, government and nonprofit groups. I'm glad to hear Paul Lister is getting solid advice and not going off on his own to do this. He has a clear strategy. You're right, it takes guts, and at least someone is doing it, but is he looking at it from a long term perspective? Who will maintain these enclosures once Paul Lister is gone and what happens should the population explode and the enclosures aren't sufficient enough to keep them safe and healthy and not encroach and cause a danger to citizens? I'm currently attending the Social Enterprise World Forum here in Edinburgh, Scotland, and several here support the idea of sustainability or the triple bottom line of fiscal, social and environmental returns. Lots to think about, no doubt! Thanks again for posting!